SEATTLE (Sunday, April 17, 2016) – Sky Blue FC (1-0-0, 3 points) opened its 2016 National Women’s Soccer League (NWSL) season in thrilling fashion on Sunday night, handing two-time defending NWSL Shield winner Seattle Reign FC (0-1-0, 0 points) its first-ever home loss at Memorial Stadium (unbeaten there over previous two seasons), 2-1. Scoring first in the contest was Hawaiian striker Tasha Kai in her return to the professional game, while midfielder Kelly Conheeney hit the game-winner in the second half. The match was the professional debut for Conheeney, who was invited into Sky Blue FC preseason camp after attending open tryouts just over a month ago, not only earning an eventual roster spot but also a starting nod on Sunday. Sky Blue FC got on the scoreboard first in the match on a play that started in the middle of the attack by Kai. After a couple of knocks, the ball landed at the feet of midfielder Sarah Killion, who one-touched a hard roller to an overlapping Kelley O’Hara on the left flank. The U.S. National Teamer then struck a ball across the mouth of the frame, where Kai went high and redirected a header past a diving Hope Solo. With the tally, the road side saw itself with a 1-0 advantage in the 15th minute of play. In the 35th minute, Sky Blue FC found itself with a penalty kick opportunity after O’Hara was taken down in the box. Stepping over the attempt was Killion, but Solo chose the correct direction and made a diving save to her right side, keeping the tally at 1-0. 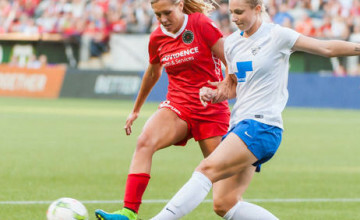 The host Reign eventually leveled the count in the 52nd minute on a series that was started by forward Kim Little inside the Sky Blue FC penalty area. The Scottish international sent distribution forward to midfielder Jessica Fishlock, who then chopped a lobbing ball to the far post. There to collect was forward Merritt Mathias, putting away the assist to make it even at a goal each. Sky Blue FC continued to scrap in an effort to regain the lead, and that moment came in the 67th minute. After midfielder Taylor Lytle raced down a ball on the far side of the Seattle penalty area, she looked and saw space in front of her. As Solo began to close the gap, she chipped a ball over the Reign netminder, where Conheeney was there to bury the ball with a back-heel volley. With the notch, Sky Blue FC again saw itself with a one-goal advantage, and it would never relinquish that lead. Sky Blue FC started six players who had never logged an NWSL minute before tonight, although one would never know that based off their performances (Caroline Casey, Kelly Conheeney, Tasha Kai, Raquel Rodriguez, Erin Simon, Erica Skroski). Casey had an incredible showing in goal for Sky Blue FC, recording seven saves in the encounter. Sky Blue FC will now return home to host the Washington Spirit on Sunday at 6:00 p.m. in its 2016 home opener at Yurcak Field in Piscataway, N.J. Tickets for that match are available now. Season and individual tickets for Sky Blue FC are both on sale! Season ticket packages start as low as $130 and can be purchased online today. For any questions regarding tickets, call the Sky Blue FC tickets department at 888-SBFC-TIX (888-723-2849), and a team representative will be happy to assist you.